Online Shopping in Dubai: Shop for OnePlus 4G Smartphone online at Menakart. Shop for OnePlus 4G Smartphone online at Menakart. 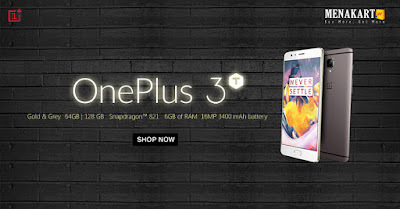 OnePlus 3T 4G Smartphone use Qualcomm Snapdragon 821 quad core 2.35GHz CPU, 6GB RAM + 64GB ROM with 5.5 inch 1920*1080 pixels screen, promises quite a fast operation speed is quite amazing and impressive. 16.0MP front camera for convenient self-capturing, 16.0MP back camera for you to record every single moment clearly; 4G, GPS, WiFi, Bluetooth, etc; all available making it the most valuable choice to buy OnePlus 3T.